Ziba and Sami Yazdan are younger than the Dickinson-Donaldsons. Sami was born in the USA to Iranian parents, whilst his wife Ziba moved over as a child. Ziba works part time as an interior designer, helping out at the family firm that builds new houses. She’s going to be a working mum and that’s feasible because of the support she gets from mother-in-law Maryam. As imigrants, they know the problems of having ‘funny’ names that other people can’t pronounced, so their daughter will be known as Susan. On August 15th 1997 the plane from Korea touches down with the two babies on board. Waiting for them at the gate in those pre-9/11 days of lax American airport security are their new families. Bitsy and Brad have brought a crowd of family and friends, all with cameras at the ready and each decked out with their badges saying MOM, COUSIN, GRANDPA etc. Jin-Ho’s arrival is captured on film whilst in the shadow of this force-field of Americaness, Sami, Ziba and Maryam are waiting quietly for their new lives as parents and grandmother to begin. Bitsy tracks down the Yazdans and asks them over to a party – of all the bizarre things, a ‘raking the leaves off the lawn’ gathering. Soon the couples and their daughters are back and forth between each other’s homes. For the first anniversary of the girls’ ‘Arrival Day’ Bitsy arranges a party, complete with a Stars and Stripes cake, a showing of the arrival video and communal singing of ‘She’ll be coming round the mountain when she comes’ – you see Bitsy is the kind of person who loves to build and establish rituals. Soon the Yazdan’s, are inviting the D-Ds over for the Iranian New Year celebrations, and in no time there’s no party in either family that lacks a good turn out from the other. The simple buffets of the early parties morph into complex sit down meals for dozens of people. There’s talk of roasting a lamb on a spit in the garden and both the host and visiting families alike are soon spending days preparing food as each subtly competes to out do the other. Bitsy’s always giving out unwelcome advice and there’s all too much ‘compare and contrast’ going on – who’s child is eating what, which is doing better at XY or Z? When Bitsy’s father Dave is widowed and takes a shine to Sami’s mother, it’s clear that despite the shared social lives, there are some major cultural barriers to overcome. Can the whole crowd stay friends in this competitive setting? Will Maryam sacrifice the sense of ‘foreignness’ that she’s chosen as her self-definition and allow Dave into her life? And finally how will Bitsy the ‘by the book’ mother create yet another new ritual to get her second child to give up using a dummy? I’ve long admired and enjoyed Anne Tyler’s writing, ever since I started with the Accidental Tourist. She consistently produces calm, gentle stories that can be taken superficially or analysed for more depth. On the surface this is just another book about families and friends; it’s quite a happy little tale. 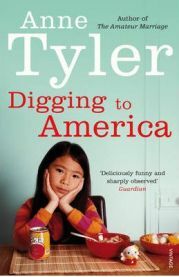 Dig a little deeper (well it is called “Digging to America” after all) and it’s a very clever examination of what it means to belong and how to deal with living in a box marked ‘other’. It’s also about how we set up and perpetuate rituals in societies that have become so diverse that shared experience no longer acts as a driver. The two girls are Korean-born children growing up in America; one with a traditional name, dressed up in miniature Korean outfits for every gathering, the other renamed and being brought up to be a proper little American girl. However, despite the clear sense of ‘otherness’, Susan and Jin-Ho sometimes seem the least aware of their intrinsic ‘outsider’ status. Born in the USA, Susan’s father Sami has rejected his language and roots and refuses to speak Farsi any more whilst his wife still clings to both her past and her present and his mother builds her sense of self out of what she once was, more than what she’s become. Even the Iranian community think of her as a bit snooty. We meet Iranians married to Americans in the extended family where the American has become self-consciously Iranianised in the hope of breaking through the differences between the two cultures. In choosing to make the Yazdan’s Iranian, Tyler has tapped into a different vein of the American immigrant experience, which is after all, a well-worn topic for writers. She has taken on a group of people who really not sure where they fit. Most of the Iranians in the book were part of the diaspora that fled the country to get away from the corruption of the Shah, not ones who left after the Revolution to escape Khomeini. They are the party generation of bright dresses, too much make-up, drinking booze and having a good time; emigrees from a country that changed beyond recognition after they left, to be moulded into an austere place or religion and restriction. Unlike many immigrants, the ‘going home’ scenario just isn’t an option because the homeland of their past has been swallowed up, leaving them as the only representatives of a lost place and time. They contend daily with the crass ignorance of their American neighbours. In one incident, Maryam gets annoyed at an American assistant who corrects her when she says she’s from Iran with “well I’ll always call it Persia” – that’s OK then. She’s an American, she can call it what she likes and because she’s an American, what she says goes. I’m sure I wasn’t the only person perpetually riled by the USA calling the Arabian Gulf the Persian Gulf throughout two Gulf Wars. There’s a very clever ‘will they, won’t they’ about the relationship between Dave and Maryam. On one hand we can imagine their friendship as the final symbol of bringing the two families together, but on the other hand, it could be the wedge that’s driven between the comfortable status quo and threatens to destroy this arrangement of cosy ritual. What’s also very unusual is the way in which Tyler avoids a central character. If there were a film made of this book, it’s hard to see any of the characters as more than supporting actors – there’s no place for the big star around whom everyone else performs. Tyler avoids a lot of the clichés we expect in a book of this type. It would have been very easy to throw one husband in to the arms of the other wife, create big fights over the children and their progress, even indulge in some overt racism out on the streets of Baltimore but she doesn’t need to use such devices because she just writes gently compelling prose that keeps you turning the pages. Yes, this is a very nice read but don’t expect a lot of action along the way. Tyler doesn’t do twists and turns but by the end, I predict you will care a lot about the people you’ve met along the way. No Comments on "Tyler Gets Dug In"